This high quality large organic bamboo wood cutting board with drip groove is made from 100% premium hard durable organic moso bamboo. It is BPA as well as toxin free and has antimicrobial and antibacterial resistant properties. It will make a great housewarming gift, wedding gift or a wonderful gift to the home chef. An eco-friendly natural chopping board with no dyes or colors added, you can use it with peace of mind knowing that your food will not get stained by any toxic material. Organic bamboo means no pesticides to contaminate your food. You can carve your fried chicken or turkey and no messy juices flowing everywhere except into the groove. 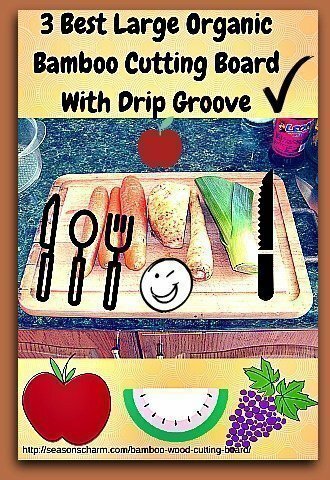 The drip groove ensures no mess. Unlike hard plastic or glass, the organic bamboo surface doesn’t dull your knives. The smooth side of the board can act as a serving tray or platter or as another cutting surface. 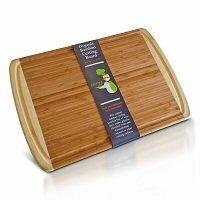 Measuring 18″ x 12.5″ x 0.7″, this extra large bamboo kitchen chopping board with groove gives you a larger surface to work on. No chemical surface lacquer and no formaldehyde based sealants are used, only a verified, food-grade, non-toxic adhesive compound to join parts together. It has a smooth surface and the board doesn’t slide when using it. Cutting dinner roasts on this extra large chopping surface is no hassle. A healthy bamboo cutting board with drip groove, this large chopping board measures 18″ x 12″ x 0.8″, big enough surface for carving your thanksgiving turkey. 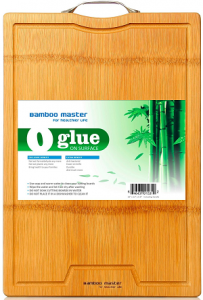 Featuring a durable seamless cutting surface with no formaldehyde, no chemical coatings or artificial dyes, this large bamboo cutting board with groove is made from natural organic bamboo. 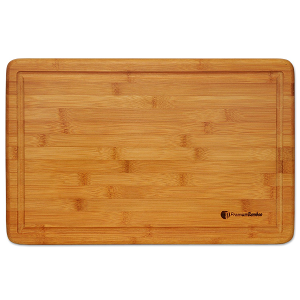 This eco-friendly strong and durable 3 ply layer structure bamboo cutting board has all the benefits of natural bamboo, meaning an antibacterial and odor resistant surface, pesticide free, easy maintenance and a surface that does not dull the knives. Reverse it to the other smooth side to be used as a serving plate or as another chopping surface. This large bamboo chopping board comes with a drip groove to collect the juices from your meats or vegetable. This leads to a more mess-free countertop. A 100% antimicrobial bamboo cutting board made from 100% high quality recyclable moso bamboo, it will not dull your knives. This large cutting board measuring 18″ x 12″ x 0.75″ is easy to maintain. Just wash with soap and hot water after using, then air dry it.